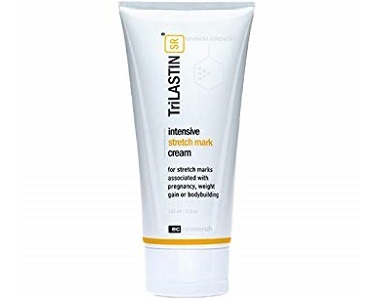 TriLASTIN-SR Intensive Stretch Mark Cream Review-Does It Work? Read our review below about TriLASTIN-SR Intensive Stretch Mark Cream. The manufacturer of this product claims that this product has been formulated to visibly reduce stretch marks. The manufacturer further claims that this product targets the top layer of the skin, makes it thicker and less translucent. By doing this it visibly reduces the appearance of stretch mark scarring. What’s in TriLASTIN-SR Intensive Stretch Mark Cream? Cetearyl alcohol – keeps an emulsion from separating into its oil and liquid components. Butylene glycol – helps other products dissolve in water. Glycerin – attracts moisture to the skin. Ppg-3 benzyl ether myristate – improves the spreadability of creams. Behenyl alcohol – a thickening agent. Caprylic/capric triglyceride – is a skin-replenishing ingredient. Ethylhexyl Palmitate, Glyceryl stearate – skin conditioning agents. Cyclopentasiloxane – used as a conditioner, delivery agent, lubricant, and solvent. Octyldodecanol – used as an emollient and emulsifier. Cyclohexasiloxane – forms a protective barrier on the skin. Octyldodecanol – gives skin a soft feel. Cyclohexasiloxane – fills in fine lines/wrinkles. Polyglyceryl-3 methylglucose distearate – contains ingredients designed to repair the skin. Retinyl palmitate – an effective antioxidant. Tocopheryl acetate – protects the body from damaging compounds. Chlorella Vulgaris extract – restructures and smooths out the surface of the skin. Serenoa – used as a skin soothing agent. Hydrolyzed soy protein – increases the ability of the skin to hold moisture. Zea mays (corn) kernel extract – is known for its oil absorbing properties. Hydrolyzed Caesalpinia Spinosa gum – is used as a natural thickener. Calcium pantothenate – used to curb skin irritation. Maltodextrin – reduces skin irritation that is caused by other acids. Niacinamide – strengthen weakened skin surface. Pyridoxine HCl – promotes red blood cell production. Silica – produces the skin’s natural ability to retain water, critical for repair and cell renewal. Sodium ascorbyl phosphate – used for its anti-aging properties. Sodium starch octenylsuccinate – used as a viscosity agent. Bht – is a synthetic antioxidant. Beeswax – provides a protection against irritants. Tetrahexyldecyl ascorbate – increases collagen levels, reduces melanin production, and brightens the skin. Polyacrylamide – is a polymer. Disodium ethylene dicocamide peg-15 disulfate – is used as an emulsion stabilizer and viscosity increasing agent. Glyceryl stearate citrate – is used as a stabilizing ingredient. Polymethyl methacrylate – reduces wrinkles or scars. Dimethicone – fills in uneven texture and fine lines. C13-14 isoparaffin – used as an emollient. Pentylene glycol – is a skin-conditioning agent. Laureth-7 – used as an emulsifier. Alcohol – helps ingredients penetrate into the skin more effectively. Disodium EDTA – helps prevent the deterioration of cosmetics. Xanthan gum – used as a rheology modifier. Caprylyl glycol – increases the antimicrobial activity of other preservatives. Chlorphenesin – used as a preservative. Phenoxyethanol – used as a thickener and softener. Water – dissolves the ingredients that impart skin benefits. 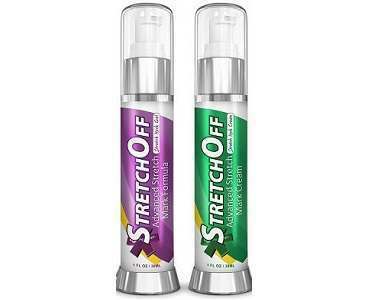 There are 45 ingredients listed above and only a few of them seem to be effective as a stretch mark treatment. Clinically proven key ingredients are crucial for treating stretch marks these ingredients are, Allium Cepa (onion) bulb extract, Aloe barbadensis (aloe vera), Emu, Safflower, Sunflower and Jojoba Oils. It has been clinically proven, that there should be no additives, preservatives or any artificial ingredients present in the formulation, as it may hinder the absorption of the product. How Do You Use TriLASTIN-SR Intensive Stretch Mark Cream? It is recommended to wash and dry the target area and to apply the cream to the targeted area until completely absorbed. This should be done two to three times daily. One container at a price of $69.00 may be purchased online at various third-party retailers as well as the manufacturer’s website. The manufacturer does offer discounted prices. This product comes with a 90-day money back guarantee, if the customer is not happy with the product they need to call the manufacturer to make arrangements regarding the return. The customer reviews are that of pleased customer’s. TriLASTIN-SR Intensive Stretch Mark Cream has some pleasing customer reviews, and the manufacturer does offer a good guarantee. But to our dismay have we found that only a few ingredients might be effective in treating stretch marks. Clinically proven key ingredients are needed to prevent new stretch marks, as well as repair and rejuvenate old stretch marks. We have also found that there are far too many artificial ingredients present in this product.